As seen at 9 p.m. on a February 2011 evening, the sky east of Orion is one of the richest parts of the Milky Way. The evening sky in early February is filled with brilliant stars: Antares in Taurus, Betelgeuse and Rigel in Orion, and Sirius in Canis Major. Just east of these, our Milky Way galaxy runs from overhead down to the horizon just east of south, and contains some remarkable gems worth exploring. Starting high overhead we have the constellation Gemini, with its twin first-magnitude stars, Castor and Pollux. Think of these as the heads of the twins, with the twins’ bodies stretching out as parallel lines in the direction of Betelgeuse. Magnitude is a brightness scale used by astronomers, with the lower numbers indicating brighter objects. If you have a telescope, take a look at Castor. This target is actually two stars, one of the finest double-star pairs in the sky. With 4.7 arc seconds of separation between its first- and third-magnitude stars, the stellar pair are easily split by any telescope. The best known deep sky object in Gemini is the open star cluster Messier 35, or M35, just above twin Castor's feet. This is a fine sight in binoculars or a small telescope. 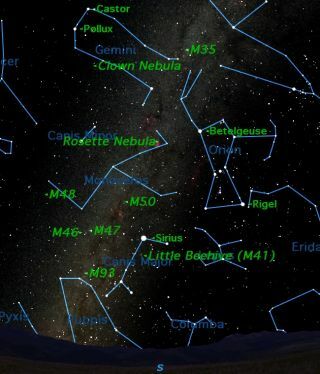 The moon will be close to M35 on the night of Feb. 13. Less known is the bright planetary nebula NGC 2392, usually called the Clown or Eskimo Nebula because of its resemblance to a face. To find it, look first for Wasat, a third-magnitude star halfway down twin Pollux's body. Wasat forms the northern point of an equilateral triangle, and the Clown Nebula is just beside the eastern point of the triangle. You will need a magnification of at least 100x power to see that the Clown is not a star. The other clue is its distinctive blue color. It's thought that even Charles Messier mistook the Clown for a star, since it is far brighter than the four planetary nebulae in his catalog. Moving down the Milky Way, we come to brilliant star Procyon, one of only two bright stars in the tiny constellation Canis Minor, the Small Dog. Only 11.4 light-years away, it is one of the nearest stars to the sun. Between Procyon and Orion lies the strange constellation of Monoceros, the Unicorn. Every star book seems to depict a different pattern for this constellation, but none of them makes sense, since this constellation simply has no bright stars. What Monoceros lacks in stars, it more than makes up for in deep sky objects. Look especially for the open cluster NGC 2244, which lies about one third of the way from Betelgeuse to Procyon. The star cluster is obvious in binoculars, but look closely. If the sky is dark enough and your eyes are sensitive, you may see a faint glow of nebulosity in your binoculars. This is the famous Rosette Nebula, one of the most photographed objects in the sky. Below Monoceros we encounter bright stars again, notably Sirius, the brightest star in the entire night sky. Sirius marks the head of the Big Dog, Canis Major. Just below Sirius is the brilliant open cluster Messier 41, sometimes known as the Little Beehive, referring to Messier 44 in Cancer as the bigger, regular Beehive. To the east of Canis Major is one of the richest areas in the Milky Way for open clusters, including two bright Messier clusters: Messier 46 and 47. Although close together in the sky, they are actually far apart in space. If you look closely at Messier 46 in a telescope you will notice superimposed on the cluster a tiny planetary nebula, NGC 2438. It is thought that this nebula actually lies about halfway between us and the cluster. This trip through the winter Milky Way shows that there is much to be discovered not far from bright and familiar objects.